Detail : Paul's twenty-seventh solo single. although the B-side was one of the unreleased recordings from the solo sessions. 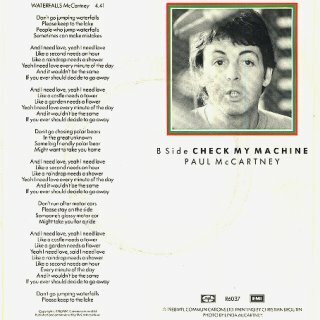 a picture of Paul taken by Linda on the rear with the lyrics of the A-side. The label was classic Parlophone. There is also a rare promo of "Waterfalls" (R6037-DJ), which has an edited version of the A-side (3:22) and a demo version of the B-side ! R'n'B Group T.L.C. 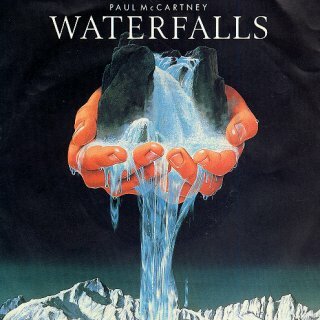 had a hit in 1995 with a song called "Waterfalls", and although the start lines of the chorus were very very similar in all respects to Paul's, it was a different song.